Finding the right sitting position and location to meditate helps you stay committed to the practice. After doing research, you’ve decided to meditate on a regular basis and dedicate yourself to this practice that’s brought peace, comfort, and transcendence to people in many different countries and cultures. There are several sitting positions you can use for meditation, so try each one to find the position that’s the most comfortable for you. Identifying the optimal sitting position for meditation is important because you don’t want physical discomfort to discourage you from engaging in this practice. Feeling relaxed and safe during meditation is essential. It’s also important to find a quiet place to sit. You don’t want people or sounds to distract you, especially when you’re just beginning to establish a meditation routine. This is the first step in finding a comfortable sitting position. 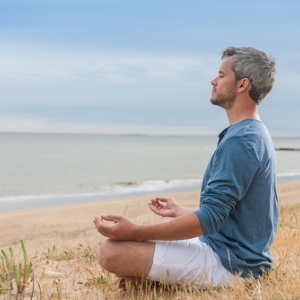 Chat with a psychic online if you’re having trouble identifying a good place to meditate. A psychic can guide you to the right location. If it feels intimidating to sit on the floor, purchase a cushion that’s specially designed to support you during meditation. You want a cushion that’s firm and durable enough to handle regular use. Sitting on the floor, positioned on the end of your meditation cushion, start with the quarter lotus. This position involves loosely crossing your legs with your feet under the knee of the opposing leg. With the quarter lotus, you’re in a position that’s relatively easy for your body to hold. Another low-pressure position is the half lotus. Cross one leg and place your foot on top of the opposite thigh. The other leg folds under the foot and can sit underneath the knee or thigh. With the full lotus, each foot rests on top of the opposing thigh. If you can’t or don’t want to cross your legs, try to sit in the Burmese position. Bend your knees and place your feet, tops down, against the floor. Because this position is comfortable, it’s a relaxed position. For those who simply can’t sit on the floor, there’s another option. With the seiza position, you kneel and place a rolled-up yoga mat behind your knees for added comfort. If you do yoga, this position is like an elevated Virasana (or Hero Pose). If sitting in a chair is more comfortable for you, embrace it. To ensure proper posture for meditation, sit without leaning against the chairback with your feet firmly on the floor. Finally, align your knees and hips to create a comfortable position you can sustain during meditation. When you take the time to make yourself relaxed during meditation, you’re more likely to continue the practice in the long term instead of giving it up out of frustration. If you have trouble staying committed to meditating, consult a phone psychic to discover what's holding you back. As you continue meditating, listen to your body and adjust positions as needed. You don’t have to sit in the same position every time.